: The four-stroke cycle is completed in four strokes of the piston, or two revolutions of the crankshaft. In order to operate this cycle the engine requires a mechanism to open and close the inlet and exhaust valves. 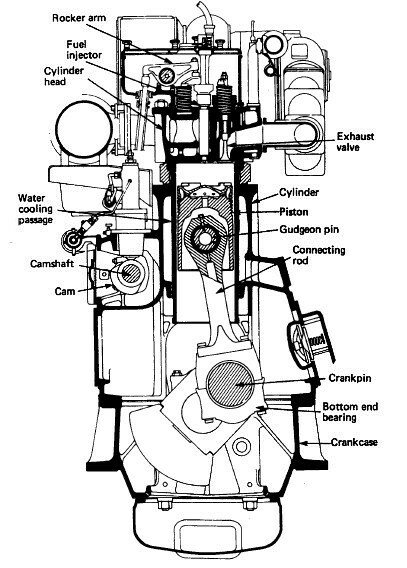 A cross-section of a four-stroke cycle engine is shown diagram. The engine is made up of a piston which moves up and down in a cylinder which is covered at the top by a cylinder head. The fuel injector, through which fuel enters the cylinder, is located in the cylinder head. The inlet and exhaust valves are also housed in the cylinder head and held shut by springs. The piston is joined to the connecting rod by a gudgeon pin. 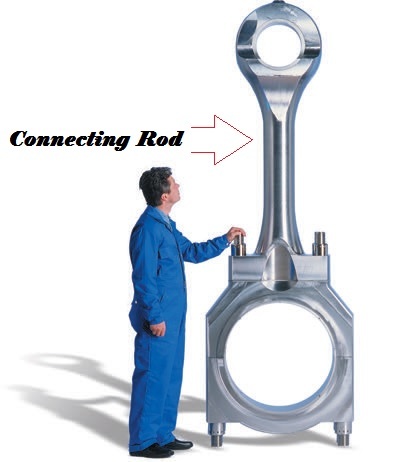 The bottom end or big end of the connecting rod is joined to the crankpin which forms part of the crankshaft. With this assembly the linear up-and-down movement of the piston is converted into rotary movement of the crankshaft. The crankshaft is arranged to drive through gears the camshaft, which either directly or through pushrods operates rocker arms which open the inlet and exhaust valves. The camshaft is 'timed' to open the valves at the correct point in the cycle. The crankshaft is surrounded by the crankcase and the engine framework which supports the cylinders and houses the crankshaft bearings. The cylinder and cylinder head are arranged with water-cooling passages around them. : The main difference between the two cycles is the power developed. The two-stroke cycle engine, with one working or power stroke every revolution, will, theoretically, develop twice the power of a four-stroke engine of the same swept volume. Inefficient scavenging however and other losses, reduce the power advantage . For a particular engine power the two-stroke engine will be considerably lighter—an important consideration for ships. Nor does the two-stroke engine require the complicated valve operating mechanism of the four-stroke. The four-stroke engine however can operate efficiently at high speeds which offsets its power disadvantage; it also consumes less lubricating oil. Each type of engine has its applications which on board ship have resulted in the slow speed (i.e. 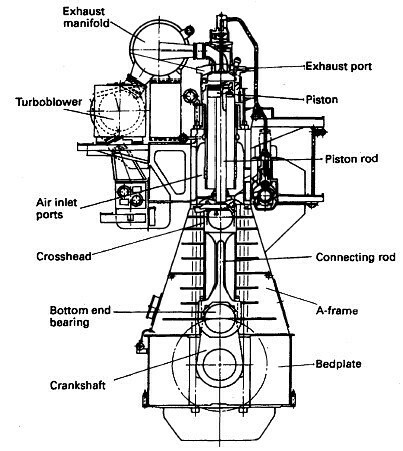 80— 100 rev/min) main propulsion diesel operating on the two-stroke cycle. At this low speed the engine requires no reduction gearbox between it and the propeller. The four-stroke engine (usually rotating at medium speed, between 250 and 750 rev/ min) is used for auxiliaries such as alternators and sometimes for main propulsion with a gearbox to provide a propeller speed of between 80 and 100 rev/min. The engine block is made of nodular cast iron in one piece for all cylinder numbers. The main bearing caps are fixed from below by two hydraulically tensioned screws. They are guided sideways by the engine block at the top as well as at the bottom. Hydraulically tensioned horizontal side screws support the main bearing caps. 2. 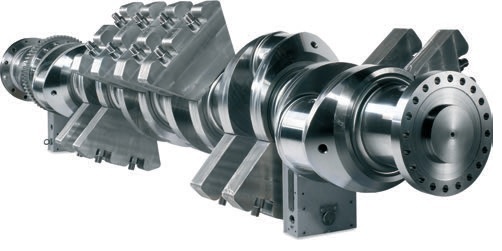 Crankshaft: The crankshaft is forged in one piece. Counterweights are fitted on every web. High degree of balancing results in an even and thick oil film for all bearings. 3. Connecting rod : The connecting rod of alloy steel is forged and machined with round sections. The lower end is split horizontally to allow removal of piston and connecting rod through the cylinder liner. All connecting rod bolts are hydraulically tightened. The gudgeon pin bearing is of tri-metal type. Oil is led to the gudgeon pin bearing and to the piston through a bore in the connecting rod. 4. Main bearings and big end bearings : The big end bearings are of tri-metal type with steel back, lead bronze lining and a soft and thick running layer. Both tri-metal and bi-metal bearings are used as main bearings. 5. Cylinder liner : The centrifugally cast cylinder liner has a high and rigid collar to minimise deformations. The liner material is a special grey cast iron alloy developed for excellent wear resistance and high strength. Accurate temperature control is achieved with precisely positioned longitudinal cooling water bores. To eliminate the risk of bore polishing, the liner is equipped with an anti-polishing ring. The cooling water space between block and liner is sealed off by double O-rings. In the upper end the liner is equipped with an anti-polishing ring to eliminate bore polishing and reduce lube oil consumption. 6. 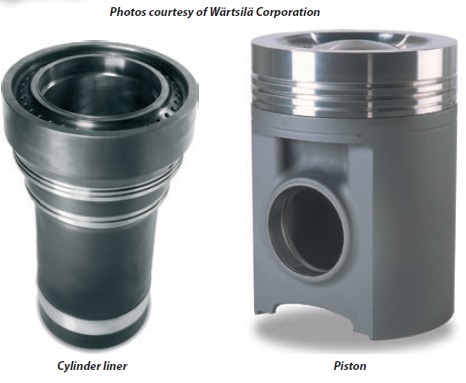 Piston and piston rings : The piston is of composite design with nodular cast iron skirt and steel crown. The piston skirt is pressure lubricated, which ensures a controlled oil distribution to the cylinder liner under all operating conditions. Oil is fed to cooling gallery in the piston top through the connecting rod. The piston ring grooves are hardened for good wear resistance. The piston ring set consists of two directional compression rings and one spring-loaded conformable oil scraper ring. All piston rings have a wear resistant chromium plating. 7. Cylinder head : The cylinder head is designed for easy maintenance with only four hydraulically tightened studs. No valve cages are used, which results in very good flow dynamics in the exhaust gas channel. The exhaust valve seats are water cooled and all valves are equipped with valve rotators. The seat faces of the inlet valves are Stellite-plated. In case the engine is specified for MDF operation only, also the exhaust valves are Stellite-plated. Engines that are intended for operation on HFO have Nimonic exhaust valves.